With an iconic rounded shape & ornate roof-lines a Victorian Conservatory is easily recognisable and gives a timeless look to your home. The appearance is created by using two straight sides with 3 or 5 faceted bay sections (although larger rooms could use 7 but this is unusual) and are quite often built with the frame set on top of dwarf walls (in brick or stone) as an added design feature. Using brick, stone or rendered low walls can allow you to match the existing house construction and make the room look less like an “afterthought”. The roofing can be ornate with fancy ridges & gutters. You can make use of fully double glazed panels in the roof or opt for a poly-carbonate construction which has the benefit of being much lighter and is probably less expensive. Doors can be fitted to either one of the straight sides or bays if the bay is big enough, but keep in mind that if your conservatory is on the small side doors that open outward would be better suited – small Victorian conservatories can need some added consideration when it comes to internal furniture placement. Most popular material for the frames would be either uPVC or hardwood, or you could investigate using engineered wood. 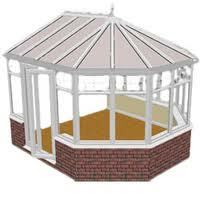 Any wooden conservatory needs to have regular maintenance to keep the wood in good condition but uPVC can be simpler to look after as giving it a good wash with detergent & water to keep it clean every now & then should be sufficient. information about pricing structures can be found here. 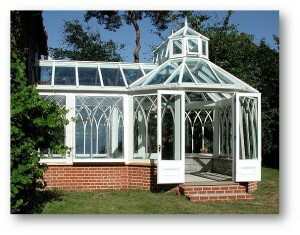 It’s unlikely for a typical Victorian Conservatory to need planning permission, however, confirm with your contractor & your local planning department before starting work – the consequences for building without planning permission if it is needed can be severe – you can get fined and your conservatory demolished if you get it wrong. Find out more about planning permission for conservatories here. Unique Lean-to Designs For Your Home. Should I Choose UPVC or Timber Sash Windows? Cheap UPVC Windows: Are They Worth Buying? What are the Top 3 UPVC Replacement Window Designs? 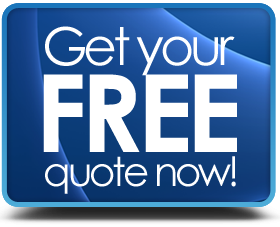 MyLocalPrices.co.uk can put you in touch with the professionals - for free. © 2015 - 2018: MyLocalPrices.co.uk - All Rights Reserved.